This tools allows you to manage your planet palettes in a easier way: automatic weighting based on the number of palettes (to have everything sorted from 0 to 1 on the "StyleRange" parameter). I plan on having export functions that let you copy one or several palettes, for form copy paste or to include in a file for sharing with images (the blank in top-left is actually placeholder for image), modification/creation of palettes via custom form, and more. I originally made this app to make sharing easier, by just sharing files that opens directly the tool or pieces of code that you copy/paste from/to the tool, and make automatically the appropriate changes to include the palette into your SE installation. At each save, the tool will make a new backup in the "backup" folder of the app, so if anything goes wrong, you should be able to recover from it. The beta is, well a beta. While things should be working normally, there are still bugs that needs to be found and exterminated. So let me know about these, or better, add an issue here. What do you think of this? Do you have any suggestions? Please let me know! Wow, that is a really good idea. The export form is now close to complete: it only miss the actual export code, but everything else is functionning. So you can now post your palettes here, "StyleRange" has been commented out to force you to replace the values (and will be ignored by the tool if you paste it back into it). As you can see ahead, there is now 3 working ways of exporting: Plain text (only the palettes), Forum (for code with colors, not working here, but working everywhere else I tried), and Forum no colors, for here. And here we have a custom palette fully created then exported via the Tool! Even between [ code ]? Ehh, that's what I thought. Using HTML names works in this forum, but not in the [ code ] part. But everywhere else it does. Really looking forward to this tool. Should help me fix up all the issues with my current palettes more easily. I released a first beta, where things should normally be working, but few bugs are still in the vincity. Read first post for download links. 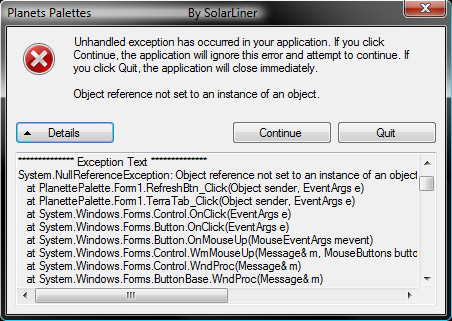 I have a problem: when I click any button (except Import/Create and Export) I get an error and it does nothing. Is there a limitation on what file paths the program can read? I.e., can it handle a filepath with spaces in it, like F:\Program Files\SpaceEngine 0.9.7.1 ? I too get that error message, though I figured a workaround for it. Just have to click continue when it pops up with the error, even though it pops up for everything. Very handy tool, nice job. Can you post your log (in folder logs, with the correct date) after having the issue? What does the message says? The log doesn't seem to show any errors, but I'll attach it. From the log, I can tell that you didn't read palettes from file, nor did you create some. Is that correct? If so, that's a bug that the array containing all the palettes has not been initialized, thus raising an error when being accessed. Added to the buglist, will be resolved ASAP. Thanks for the feedback! can it handle a filepath with spaces in it, like F:\Program Files\SpaceEngine 0.9.7.1 ? I installed SE 0.971 with the default path, so "C:\Games\Space Engine 0.971" and it handles it perfectly. I'm about to release a patch witch will resolve the known bugs, make the unhandled exceptions boxes disappear (instead there will be text on the bottom of the main form that will show the error when there will be one), and log more things. Please go to the issue and download the patched "PlanettePalette.exe". Just replace the old executable, and then test everything that was bugged out. At last, please send le the logs. FYI, I have not been able to reproduce the bug on buttons, only on right mouse clicks over the palettes list. It's possible that I'm doing something wrong. I didn't see any instructions on how to use this tool, so I tried to do what made sense. I assumed that once you input the path to your SE directory then it would automatically find and load the palette file. Is this correct? And if not, what am I supposed to do?